Loveseats There are 126 products. Talk about fine lines and great curves. 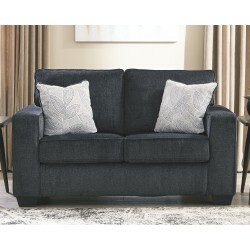 That's the beauty of this standout loveseat made to suit your appreciation for clean, contemporary style. A striking flared frame, comfy pillow top armrests and an ultra-soft upholstery that holds up to everyday living complete this fashion statement. Align your living space with a clean-lined, highly contemporary look that doesn't overlook your lust for cozy comfort. 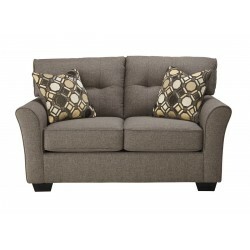 This stylish loveseat's flared profile, track arms and boxed cushions are beautifully on point. Chunky chenille upholstery is loaded with visual and tactile texture. Renew your love of blue with this casually cool loveseat. Its textured indigo-hue upholstery is a welcome sighting in a sea of beige. Track arms and a 2-over-2 cushion design enhance a clean, crisp aesthetic that simply works. Pair of diamond weave pillows add to the contemporary vibe. If you can't decide what's more important: cool style or cozy comfort, you're in luck. This loveseat is the perfect compromise. Covered in a decadently plush yet practical fabric, this exceptionally chic loveseat in dark tan entices with indulgently thick pillow top armrests sure to please. And the comfortable price might well put you at ease. 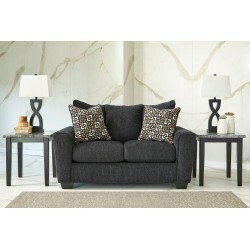 Indulge your lust for comfort and love for contemporary design with this loveseat. Made for easy, everyday living, it's upholstered in a sumptuously soft fabric with a hint of herringbone texturing. Divided back design puts pillow plushness and support right where it's needed most. Overstuffed pillow top armrests are the stuff dreams are made of.